What has been your modem issues? I had issues as well and want to see if they are the same. I was having connectivity issues. I would show I only had 2 bars outside with a Tmobile tower within 100 yards from me. Also the speed would fluctuate, it would go from 1mb down then 10mb down all within 2 seconds of each test. I called tmo, they sent me a new note 2 but I am still experiencing the same issues. I wasn’t able to connect to data, at all, or it would connect for a few seconds and then nothing. THEN I wasn’t getting signal. I think there’s some issues, hardware wise, that they aren’t willing to announce. Mine was replaced as well and has been going good so far. I had the same problem 2 months ago . At work I would get 2g edge. Couldn’t dail out without an network that was crazy. Spent a lot of money on this phone for it not to make important calls from work so they sent a replacement. Just got it.i was hoping it was 4.2.2…shucks!! What Joey said. Expect to wait at least 6 more months for that; probably more like a year. 4.2 will be released this month. Goto xda developer to find out how to get it first! AOSP 4.2.2 roms have been out on xda for a long time already (their are tons of them). The devs on xda can’t release a Sammy based 4.2 rom until Sammy releases it first, the code is not open sourced. Go to menu, settings, about device, software update to manually check for the update. I just did that and got the update of about 14mb. Yeah I was hoping for that new samsung update that would give us the S4 stuff. But wait I shall. Not even the international version has that yet. Don’t expect that for 6-12 months. My phone is rooted, I know I can’t get it OTA, but can I get the update manually through my computer? Thanks. No. You can’t. It’ll remove root. Just wait until someone at XDA gets a flashable file for rooted users. Usually takes less than 1 day after release. Yes you can update manually through your computer, if you flash back to stock, and use triangle away from the play store to reset the flash counter. I don’t know if I want to update. Updates usually kill battery life, so i only want to update if it adds features. Just updated mine. No changes. Even smart swich app didn’t install. Have to download manually from google play. 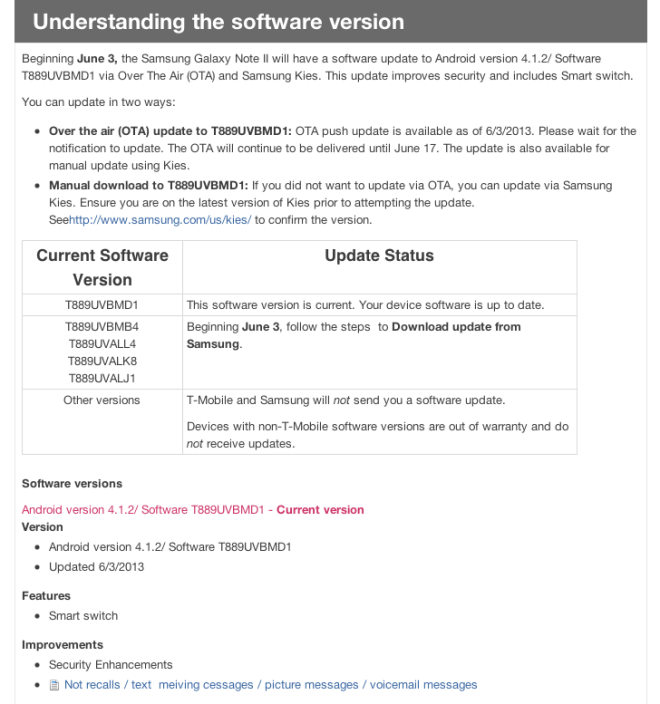 While there is a mobile version of Smart Switch, the Smart Switch they are referring to with this update is a computer program which Samsung created. Initially it was created for the GS4, but this update makes the Note 2 work with it as well. Essentially, if you are converting to an S4 or Note 2, Smart Switch will read the backup file of your old phone (just be sure to create an unencrypted backup file of your old phone before trading it in!) and push all of the content (contacts, calendar, music, pictures, videos…) over to your new phone. It even makes a convenient list of all of your apps so you can download them again without have to search for each one individually. This tool is especially useful for people switching from an Apple device. Go to http://www.SamsungSmartSwitch.com for information on how to use it and to download it for free. I am having the same issues as those other note 2 owners. I have pretty much had no phone for 2 weeks now. My signal is in and out faster than I can keep up. If it’s a hardware issue I hope Samsung steps up and fixes it soon! the lockscreen bug with the emergency dialer was fixed. you no longer have a full second before it locks again. Anaheim and San Bernardino are up as of today. …so you’re saying this update helped you achieve this? I didnt think this update did anything for LTE. I just got my update this morning but had the 4g lte a week ago. “ends June 17th ” Why? your saying people who buy a note 2 after cannot update? Also how do you use “Smart Switch”? -Faster, and smoother home screen transistions. -Wake up bug no longer locks device out after a call. You can download Smart Switch from Play. Anyone having problems with cut and paste? I lost the ability to cut from an email and paste into a fedex tracking form.